GRILL DIRECTIONS: Heat grill. In medium bowl, combine ground beef, blue cheese, parsley, salt and pepper; mix well. Shape mixture into 4 patties, 1/2 inch thick. When ready to grill, place patties on gas grill over medium heat or on charcoal grill 4 to 6 inches from medium coals. Cook for 11 to 13 minutes or until patties are thoroughly cooked, turning once. Meanwhile, heat oil in medium skillet. Add onion; cook and stir over medium heat for 3 to 5 minutes or until tender. Cook 15 to 20 minutes or until onions are golden and glazed, stirring frequently. Place buns, cut side down, on grill. Cook 1 to 2 minutes or until buns are lightly toasted. 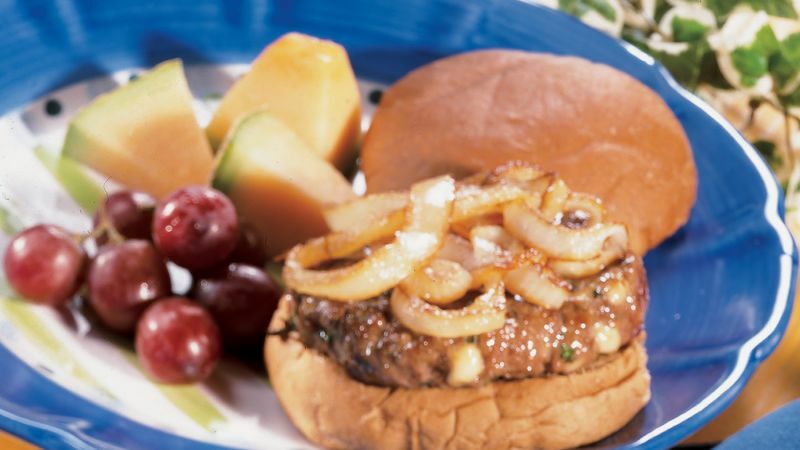 Place patties and onions in buns. To broil patties, place on broiler pan; broil 4 to 6 inches from heat using times above as a guide, turning once. Place buns, cut side up, on broiler pan; broil 1 to 2 minutes. Sweet onions, available during spring and summer, have a mild flavor. Vidalia, Walla Walla and Maui are three varieties of sweet onions that are very juicy. Serve these burgers on any flavorful bun such as sourdough or whole wheat. For extra blue cheese flavor, spread toasted buns with your favorite blue cheese dressing before assembling the burgers.